In my craft room at least, spring is in the air. We still have snow outside, but the temperature is supposed to reach 60 degrees in a few days, so I have spring fever! Birthday Blossoms for Spring Fever! While flipping through the Stampin’ Up! annual catalog on page 8, I came across this sample and just had to create my own version. The main features I cased were the tag with flowers and stamping background images on the card base. Start with an 8-1/2″ x 5-1/2″ piece of Tip Top Taupe cardstock, folded in half. Stamp some background images in Versamark ink and heat emboss them with Silver embossing powder. This sample uses images from the Stampin’ Up! Butterfly Basics and Birthday Blossoms stamp sets. Very subtly, the netting image from the Butterfly Basics set can be stamped in Tip Top Taupe ink behind the white tag as well for a little extra background color. Cut a 4-1/2″ x 2-3/4″ piece of Whisper White cardstock. Use the Stampin’ Up! Trio punch to create the pretty corners on the bottom edge. Stamp leaves in Pear Pizzazz ink at the top and bottom, leaving room for your sentiment in between. Stamp the greeting in Watermelon Wonder. I find myself reaching for this cheery color quite often, especially during the dreary winter weather. Stamp one flower in Watermelon Wonder, one in Daffodil Delight (another color to brighten your day) and one in So Saffron, using either the stamp in the Birthday Blossoms set or one from the Flower Shop stamp set. Slightly curl the edges of the leaves with a Bone Folder or pencil. 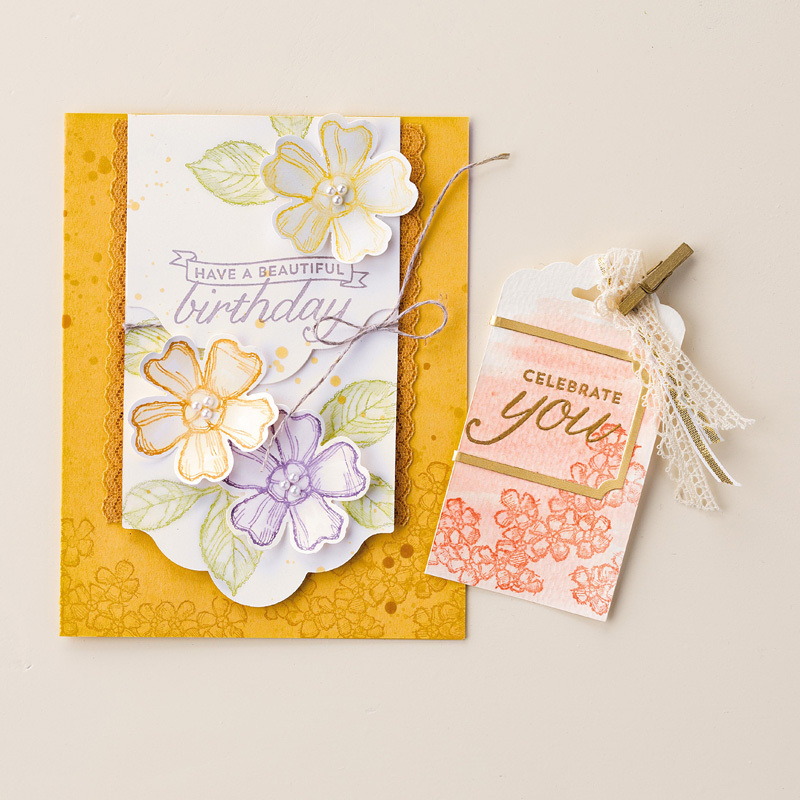 Punch out the flowers with the Pansy Punch, which coordinates with both flower stamp sets. It can be purchased separately, or bundled with the Flower Shop stamp set at a 15% discount. Attach the flowers to the white tag with Stampin’ Dimensionals. If desired, add tiny Basic Pearls to the center of the flowers for a little extra prettiness! Finally, send your card off to someone celebrating a birthday this week! Shhhh – don’t tell her I told you, but it’s my daughter’s birthday on Sunday, March 6th! Birthday Blossoms, Butterfly Basics, Flower Shop, flowers, punches. Bookmark.